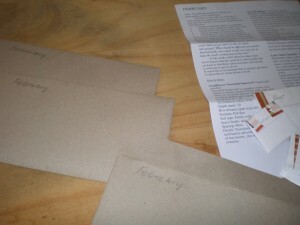 These are the first prototype seed envelopes. Towards the end of January I ordered 8 different packs of seeds from Green Harvest organic, using the list generated by gardenate.com as a guide to what’s in season. The seeds cost about $35. I folded up envelopes from A5, then A6 pieces of scrap paper, which took approximately 10 minutes on average to fold and fill 10 envelopes for each seed. They are not air or water tight, as the seeds are not intended to be stored! It took 15 minutes to make up the complete packs. So approx 95 minutes in total. The individual seed envelopes just have the name of the seed, which can be cross referenced on an a4 sheet of info with all the seed details. I cut and pasted the description for each seed from the web and typed out the planting info. Some feedback below suggests there is too much info. One thing I wonder about is that there is separate distances for plant spacing and row spacing. I personally don’t plant much in rows, because it’s too tempting for pests to come an obliterate their favourite thing. I will consult some gurus and see if this figure can be averaged into one radius. I have ordered little white paper bags, which should reduce the time taken to pack the individual seed envelopes (and stop seeds from exploding everywhere). The recycled envelopes don’t stick shut very well which is unacceptable, so I will try another type, for when they get mailed. Oh yeah, next time I am going to mail them… it was nice to hand deliver them, but not sustainable. Include a seed saving guide (in response to suggestions below). I am keen to get the seed info into a database, so I start automating the printed info, since typing them out is going to be time consuming (I didn’t even record how long it took last time). Too much info on the sheet. Will try and whittle it down or explain some things graphically or contextually (don’t ask me how). Thanks Lynda. Yes John, this is a good idea, sorry I forgot to put fun things in this round. Great idea, Katelijn. We will include them for March/April. This is obviously an unforeseen important aspect of the project. Let’s do it, thanks Pete. Mystery seed comp. First person to guess correctly wins a free next month’s seeds. Hope your idea can expand to other climates…like brisbane! Or, I’m happy to see what is successful in both climates! I am a bit crap at gardening, and would be interested in some guidance in getting started. Do you have a start up pack with a shopping list for potting mix/fertaliser etc? Can you post some photos of what my garden should look like when, so I can know if my little plants are doing well, or they are silently begging for some more attention?